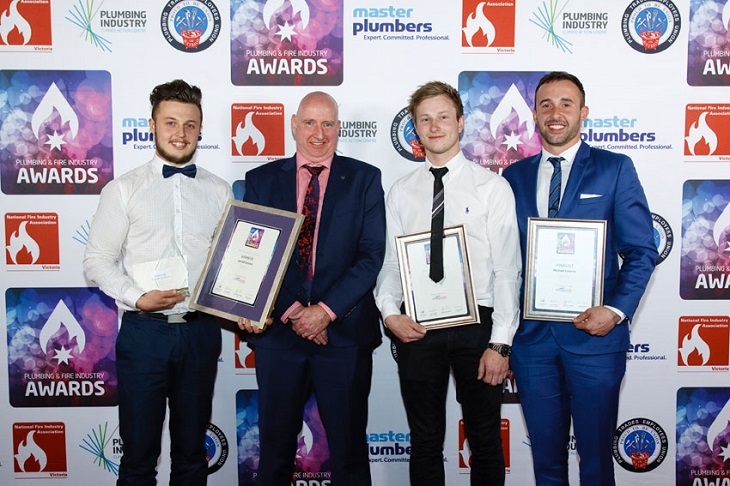 Congratulations to plumbing apprentice Jarrad Gstrein on winning the NA Smith Gas Award at the Plumbing and Fire Industry Awards in October. The NA Smith Award is a $1000 prize given to a fourth-year apprentice who has excelled in gas studies. It is named in honour of Neil Smith, chairman and managing director of the Gas and Fuel Corporation from 1970 to 1990. ESV is a platinum sponsor of the awards and Gas Operations Manager Paul Harris was on hand to present the Neil Smith Award to Jarrad. Paul also congratulated Liam Bell and Michael Caserta, who were both finalists for the award. Jarrad is currently undertaking Certificate 4 in Gas and has gained experience ranging from gas mains for large multi-storey apartment buildings to hooking up gas meters and sizing and running domestic housing gas runs. He has completed his Journeyman’s and apprentice trade school training and a business and health and safety certificate 4 in drainage. Jarrad said he chose plumbing because it is a great career that is physically and mentally challenging while also providing an integral community service. “Gas is a very important aspect of plumbing – if gas is not done correctly it can take lives. I believe that pursuing a career in gas studies is important for the community,” said Jarrad. In the future Jarrad hopes to have his own plumbing and gasfitting business in the eastern suburbs of Melbourne.